Kumho’s latest environmentally-friendly car tyre! Lutterworth – May 3, 2018. Consumers have varying priorities when replacing their car tyres. Price will always be a key factor, but while some drivers require optimum grip, others favour minimum wear (or, long tread life). More and more are, however, selecting tyres of notably low rolling resistance, thereby saving money at the pumps and therefore the world’s natural resources as well. 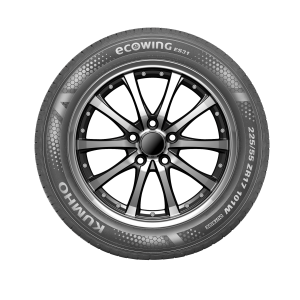 With sizes ranging from 155/65R14 to 225/55R17, the ECOWING ES31 can be fitted to the vast majority of small and medium hatchbacks, saloons and estates, including such perennially popular British sellers as: Ford’s Fiesta and Focus; Volkswagen’s Polo and Golf; BMW’s 1, 2, 3, and 5 Series; Audi’s A1, A2, A3, A4 and A6 models; and the Mercedes-Benz A, B and C Class cars.